How does the Internet change China? And how does China change the Internet? Within a few years time China has become home to the largest online community worldwide. And even though freedom of expression remains restricted, online and offline, the Internet has transformed Chinese society fundamentally. But China is not just adopting the Internet it is also adapting it. 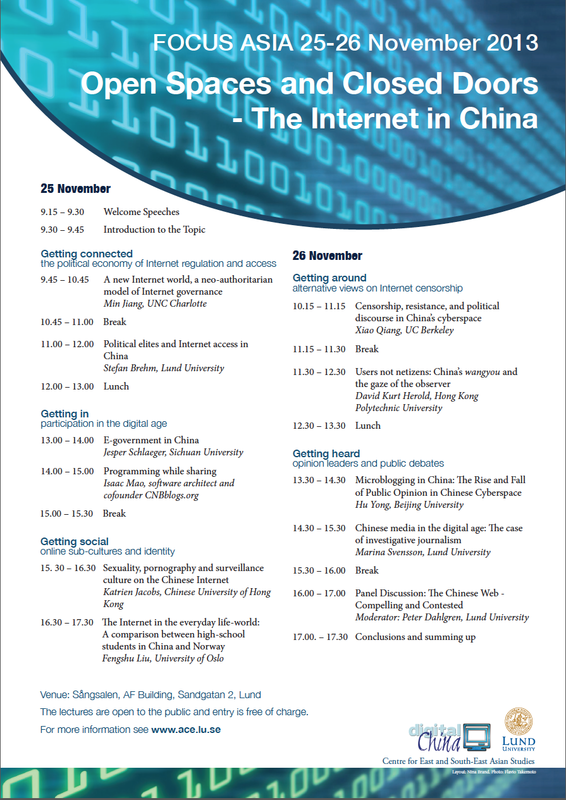 The Digital China Research Group at the Centre for East and South East Asian Studies, Lund University organises an open conference that provides intriguing insight into the transformative power of the Internet; how it changes China and how it is changed by China. The symposium is an opportunity to meet and discuss with some of the most prominent experts in the field such as Xiao Qiang, founder and editor-in-chief of China Digital Times; Hu Yong, media critic and Internet pioneer; and Isaac Mao, blogger, entrepreneur, and Internet philosopher. For more information please visit also our conference homepage.